Part 2 of the Interview with Vigyan Gadodia of Sahaj Group. See part 1 here. Explain in more detail, why dairy farming? Also, why the need to be in production? Why not just milk-distribution? On standalone basis it is a profitable activity for a farmer. It is the most cash-flow friendly business activity for farmers (if planned properly) , which can provide a regular income to meet their expenses. Farmers understand the fundamental activity of rearing cattle. So the learning curve is already there. There is a scope for significant enhancement in management practices. This can lead to an overall improvement in the business profitability. Lemme give you some specifics.The most fundamental error we make in cow management is to discount cow intelligence. In India we generally keep our cows tied down all the time and feed, and milk her as per our schedule at the same place. Some of the key parameters of improvements that Sahaj is working upon are:Labor Efficiencies – This makes the process very labor intensive. Open housing allows the cows to roam freely, be less aggressive (and hence easier to manage), and cows can eat and drink whenever they like and they can come to common milking place. Average cows handled/person in Indiais 8-10 Vs 20-30 in organized farms internationally.Yield improvement – India average milk production (even in crossbreed cows) is around 2500 ltrs/year, vs the average of 8000 – 12000 ltrs/year production done by farmers in US / Israel / Holland / Australia. 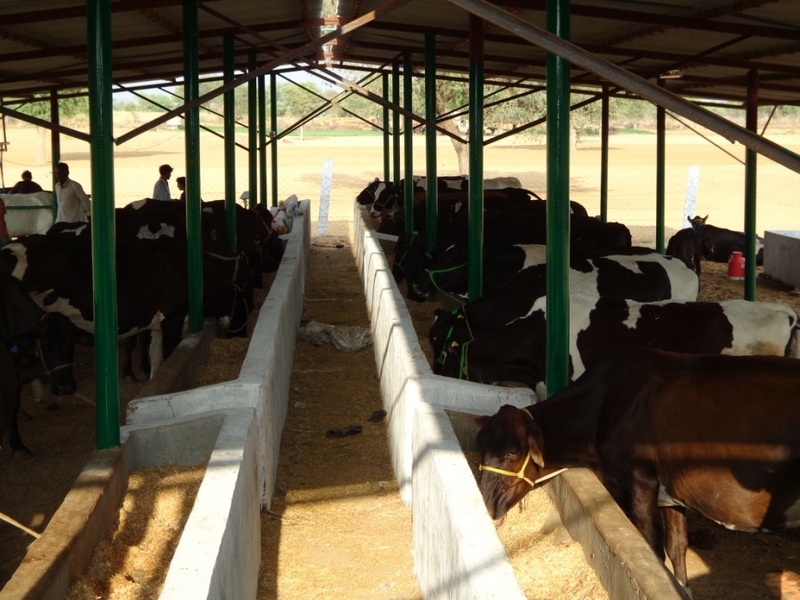 Some progressive Punjab farmers have reached a herd level production of 6000 ltrs/year by using the above mentioned good management practices.Quality of Milk – The bacterial content in the raw milk in India exceed 10mln CFU/ml, Vs internationally accepted standard of 2 lac CFU/ml. Large part of this quality gap is due to the unhygienic milk handling (hands / buckets / open to shed air etc) and delay in chilling. Milk quality can be significantly improved by providing cows with good quality drinking water and using efficient cleaning methods. The overall purity of milk is a serious concern creating an opportunity for quality premium producers supply chain. We feel this is a significant enough opportunity. A farmer gets Rs 18-20/ltr for cow milk if he supplies to a dairy, whereas a village level consumer is happy to buy the same milk at anywhere between Rs. 23-26 / ltr on a regular basis. This is because of a quality concern (more like insider knowledge) at rural consumer level and they prefer to pay a premium for getting un-adulterated milk from neighborhood farmer. Supply-chain/logistics constraints like late chilling, mixing of water, synthetic milk etc becomes more pronounced for the cooperative milk collection and hence entering the urban consumer level. So, local consumer (village level) gets the best quality milk, and urban consumer gets mixed and sub-premium quality milk. Can you give us a feel of where Sahaj is right now? Vigyan: We have 23 cows under management as on date and a team size of 12 people gearing to scale up the operations to 500 cows. We are in the process of fund raising for our expansion activity. If the funding comes through in time, we shall be targeting 1000 ltrs/ day by Dec 2012, and upto 5000 lrs/day by March 2013. Why do/should clients buy your products. Who are these customers? What experiments have you done on product-market fit. Is it a challenge to identify & reach out to clients ? Vigyan: Customers buy our product because of Purity and Quality. Some of the customers have already started commenting on better digestion of cow milk . They can easily draw a contrast with the regular pasteurized milk in the market. Our current consumers are in Jaipur city. We started with milk sampling and these families/individuals started with switching a part of their requirement to our milk. Gradually many have switched 100% cow’s milk. We are yet to design our marketing plans, so it will be difficult to comment on expected marketing expenditure as yet. However, yes, there will be a bleeding on operational basis as well, till we hit a threshold volume of at least 700 ltrs/day of supply in the city. We have started pouching much early in our evolution to address the concerns of contamination / adulteration in the transit. Because of pouching it is easier and faster to reach out to a larger audience and explore different distribution models like retail counters as well. We intend to leverage this strongly in our marketing efforts. Your 5 key learnings in the first 12 months of the venture ? Financial markets (equity & debt) are averse to exploring new (un-heard) ideas and do not like startup ideas that are not following a hockey stick projection.Most VCs have never evaluated such a model, and the existing large farms are typically backward integration by large scale diary processors, who do not need venture funding.Also, this is a capital intensive model to begin with, and the idea of extending the good management practices amongst farmers is yet to be proven. Most VCs are used to looking at technology based hockey stick growth models, and are hesitant to look at an operationally intensive model like Organized Dairy farming. It is difficult to cultivate a long-term view in rural youth (Vs a very shortsighted approach), but if you can do it you can change India. Most of the quality management services can be implemented at a farmer level, provided a basic minimum scale is achieved. Your goal for the next 3 years. Vigyan: Create a model dairy farm (200 – 500 cows). Extend dairy farming services and become a significant milk producer in the state. Expand the product basket to include fruits and vegetables. Are you looking for additional talent to join ur team? What opportunities exist in your team for our readers. Vigyan: Yes we are. In our team, we look for people fascinated by the rural India challenge (Opportunity) and willing to commit themselves to working out of rural setting for 70% of their working week. We are also open to partnerships with other ventures in similar areas, to exchange best practices etc. I sincerely feel we still need more people coming into Rural space. We are also exploring the crowd sourcing model now in terms of the actual payout (economics) we can offer to investors under this model. I hope to launch the model very soon. So maybe then all of you could own a small part in Sahaj.